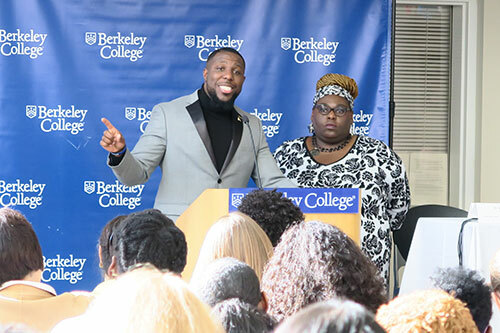 Photo Caption A: Wes Bellamy, EdD, Vice Mayor of Charlottesville, VA, delivered the keynote address at the 17th annual Diversity Issues in Higher Education Conference, hosted by Berkeley College at its campus in Woodland Park, NJ, in partnership with the American Conference on Diversity, on November 17, 2017. Leaders of the higher education community stood together at Berkeley College to make meaning of today’s cultural climate at the 17th annual Diversity Issues in Higher Education Conference on November 17, 2017. The event was hosted by Berkeley College at its campus in Woodland Park, NJ, in partnership with the American Conference on Diversity. More than 100 educators, civil rights advocates, and students from more than 20 institutions and organizations participated in panel discussions and breakout sessions to address critical diversity challenges in academia, the workplace, and the community. Wes Bellamy, EdD, Vice Mayor of Charlottesville, VA, delivered the keynote address at the Conference. The youngest individual ever to be elected to the Charlottesville City Council, Dr. Bellamy acknowledged how the tragic events of August 12, 2017, in Charlottesville exemplify the issues of hate and bigotry plaguing the nation. However, he challenged the audience and students to take a stand against hate, and emphasized how love and change is more powerful than anything else. “Are you using your skills, your resources, your talent or your treasure to encourage and empower others, or are you standing idle while you see injustice, while you see bigotry, while you see all of the negative, evil things going on?” Dr. Bellamy said. 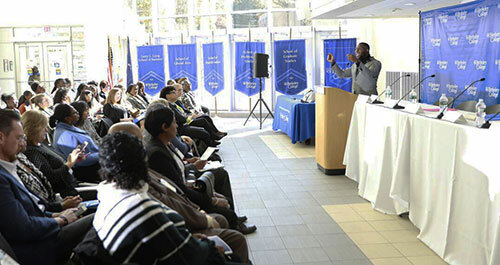 Photo Caption B: Wes Bellamy, EdD, Vice Mayor of Charlottesville, VA, delivered the keynote address at the 17th annual Diversity Issues in Higher Education Conference, hosted by Berkeley College at its campus in Woodland Park, NJ, in partnership with the American Conference on Diversity, on November 17, 2017. Pictured above with Dr. Bellamy (left) is Elizabeth Williams-Riley, President and CEO, American Conference on Diversity. Click here read more about Dr. Bellamy’s keynote address in a story published by The Record / NorthJersey.com. Ms. Rivera participated in a panel discussion with seven students from Seton Hall, Stockton University, and the College of Saint University. Each student openly shared how issues of diversity have been handled at their respected colleges, and in what ways they themselves are working to enhance equality in their communities. Ms. Rivera is pursuing a Bachelor’s degree in Accounting at Berkeley College. She serves as President of the National Society of Leadership Success, Alpha Sigma Phi New Jersey chapter at Berkeley College, is a student ambassador and a member of the Student Government Association at the Woodbridge, NJ, campus. 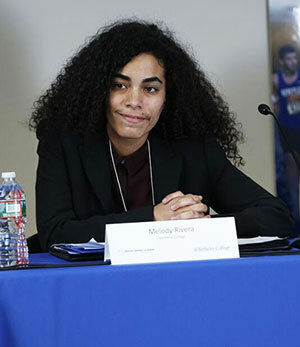 Photo Caption C: Berkeley College student Melody Rivera of Perth Amboy, NJ, participates in a student panel discussion at the 17th annual Diversity Issues in Higher Education Conference, hosted by Berkeley College at its campus in Woodland Park, NJ, in partnership with the American Conference on Diversity, on November 17, 2017. Topics of breakout sessions that followed the first panel discussion included “History of Activism and Resistance: Tools & Strategies,” “How Do We Create Inclusive Communities? Diversity, Immigration, and Interfaith Showcase,” and “Transforming Traditional Activism: Allyship & Solidarity.” Among those in attendance during the sessions were Charlane Brown-Wyands, JD, and Gary Krulish, Co-Chairs, Justice Studies, Berkeley College School of Professional Studies. 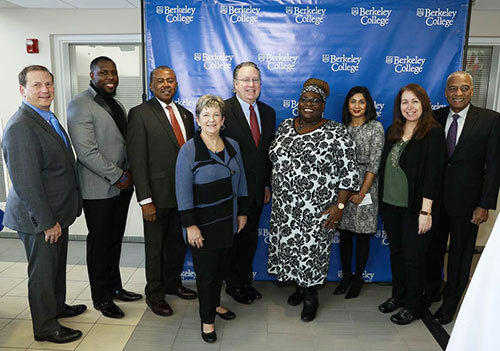 Photo Caption D: Berkeley College hosts the 17th annual Diversity Issues in Higher Education Conference at its campus in Woodland Park, NJ, on November 17, 2017, in partnership with the American Conference on Diversity. Pictured above from left to right are Kevin L. Luing, Board Chairman, Berkeley College; Wes Bellamy, EdD, Vice Mayor of Charlottesville, VA; James Harris, Past President, National Association for the Advancement of Colored People (NAACP), New Jersey; Eileen Gale Kugler, author of Innovative Voices in Education; Michael J. Smith, President of Berkeley College; Elizabeth Williams-Riley, President and CEO, American Conference on Diversity; Kavita Mehra, Executive Director, Sakhi for South Asian Women; Mary Chayko, Professor and Director of Interdisciplinary Studies, School of Communication and Information, Rutgers University; and Lawrence Hamm, Chairman, People’s Organization for Progress.